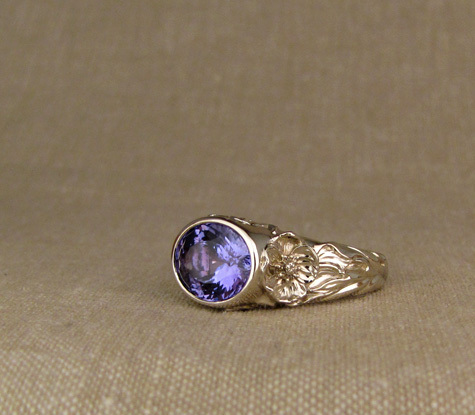 It has been really fun to see how this ring transforms with each new and totally different stone I make it with. I’ve been lucky enough to get to try it with the original boulder opal of course, this glossy and awesome smoky semi-black Lightning Ridge opal, an insanely gorgeous carnelian that looked like jelly candy, and a gorgeous white opal with a flash of turquoise running through it. 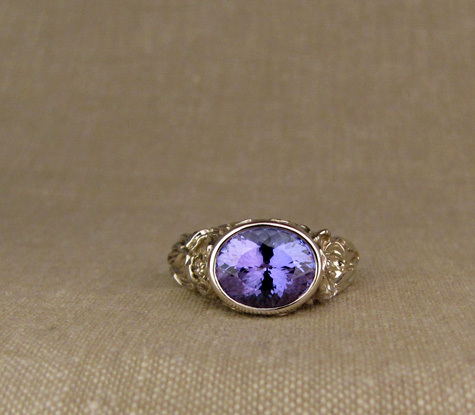 I love the different vibes each stone lends this ring. I’m ready to make more! 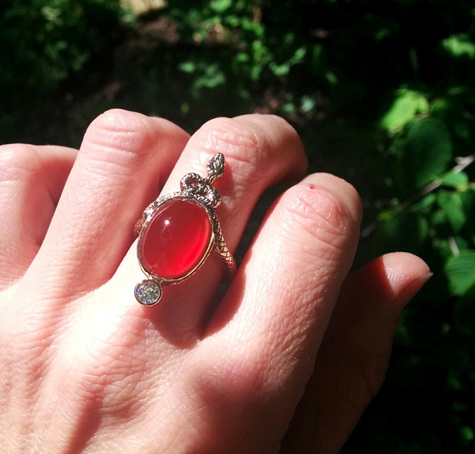 This is the nicest carnelian I’ve ever seen; it is all natural color and actually the original stone was larger and I had it cut down to fit this setting. 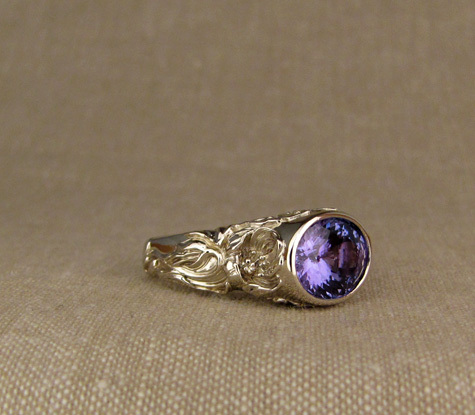 The diamonds in this and the smoky black opal above are both antique Old European Cut diamonds. 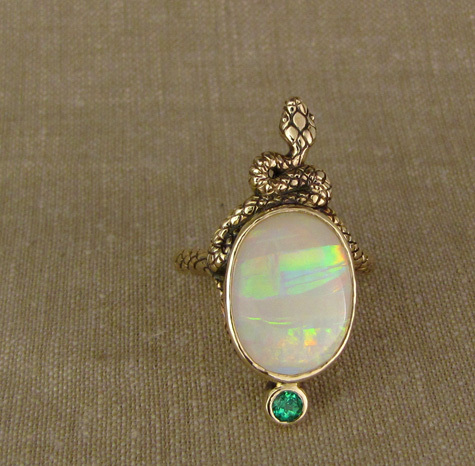 Pairing a bright green-blue paraiba tourmaline with this opal was a brilliant idea. 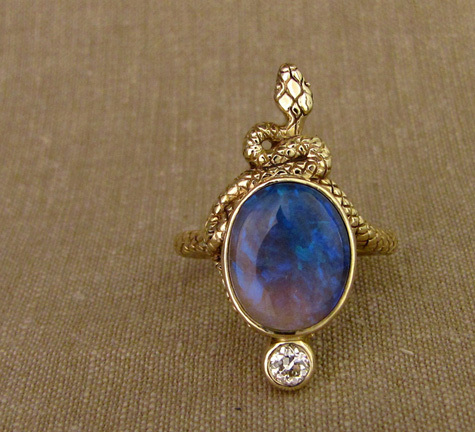 It looked so good against the yellow gold and really brought the blue and green flashes out of the opal. I’m headed *very* soon to the Tucson Gem Show, where I will have the opportunity to purchase special and unusual stones for custom pieces. I have a number of you on my to-shop-for list, but I feel like I am forgetting someone! Please check in with me if you have not corresponded with me very recently regarding shopping @ the gem show for your piece. 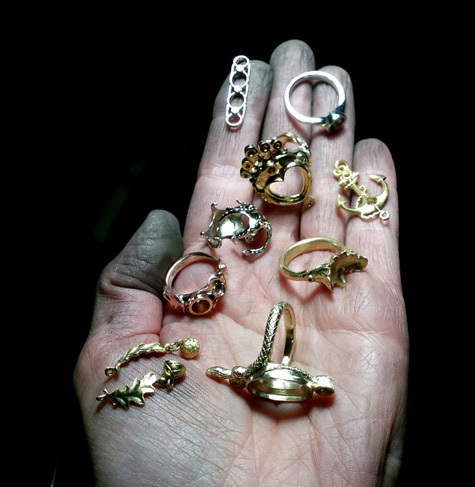 If you are a new client and are interested in having a piece made using something unusual (unique rose-cut diamonds, colored stones, pearl, etc. ), now is a really good time to get things cooking. I do have a lot of contacts for many of the stones I use, but nothing beats me being able to see everything at once in person and pick individual stones out of thousands. Contact me at my email address: cheyenneweil@gmail.com and we’ll talk!